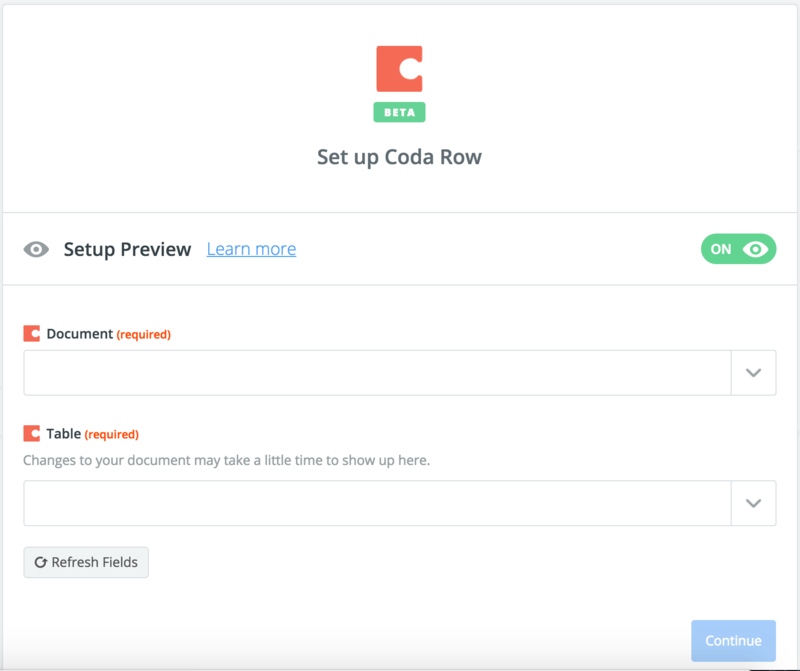 If you are a frequent user of Zapier, you may be familiar with the Find Row & Update Row combination. Upsert Row is similar except that it creates/updates a row in one step instead of two. We recommend you use whichever action is easiest for you. If you don't have a Zapier account, sign up and create one first at Zapier. 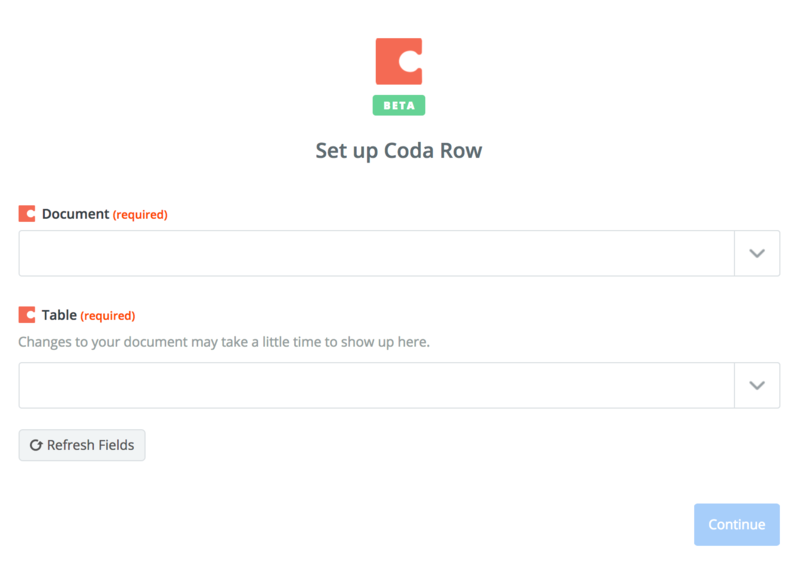 You can create new rows in Coda through Zapier based on a trigger coming from another app. 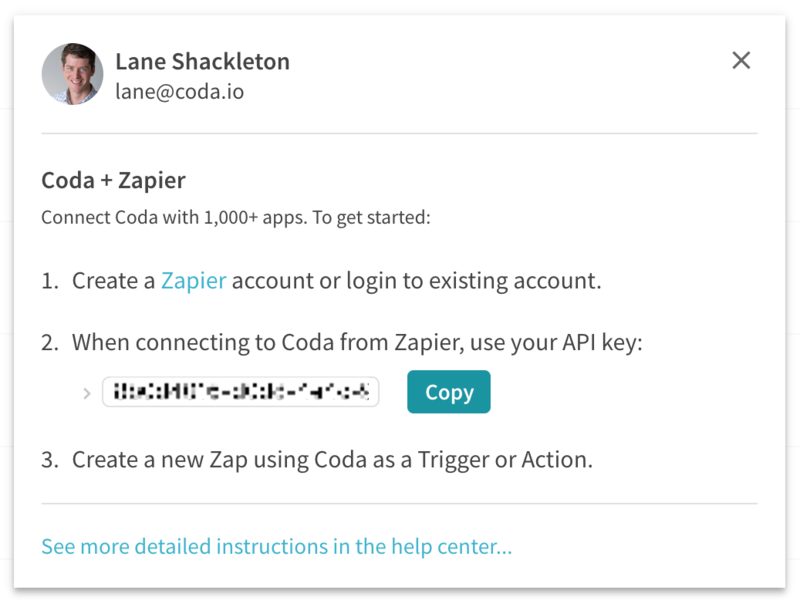 1) Start by clicking "Make a Zap" in the top right corner of your Zapier account. 2) Connect your trigger app - this will be the source of data that gets pushed into your Coda doc. 3) Type 'Coda' into the Action App search box. 4) First, you'll be asked to choose an action - pick "Create Row. Go back to the Zapier pop-up window and paste in your key. 6) Hit "Save & Continue" to continue the set up. 8) The next step is setting up the row you are inserting. Once you've selected a table, the page will refresh with a list of columns that you can insert data into. Note, if you need to add more columns, go back to the Coda doc to add them and then refresh the Zapier page. It make take a few seconds for the new columns to show up. 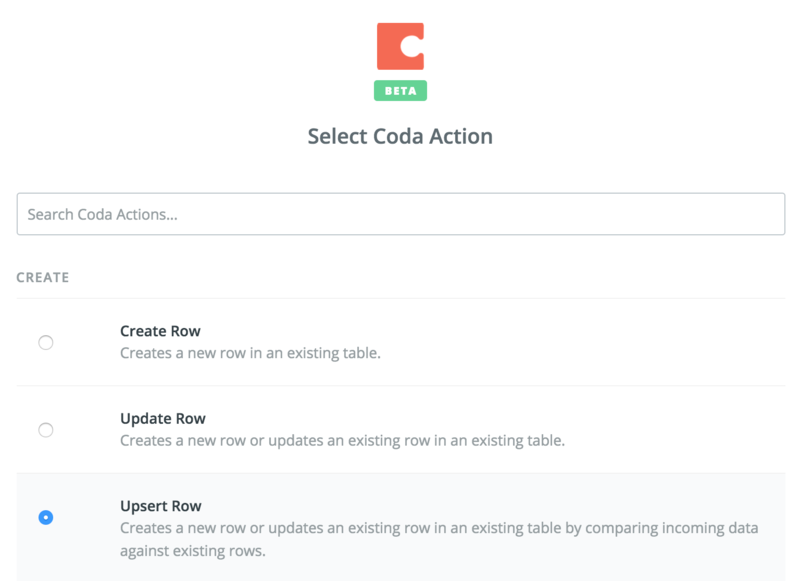 When Coda is a trigger, you can trigger actions in other apps when you create new rows in Coda. 2) Type 'Coda' into the Action App search box. 3) First, you'll be asked to choose what your trigger should be within Coda. At this time, we only have one trigger - go ahead and select "New Row". 4) Now select from your Coda docs where you would like the trigger to come from, and which table should be the trigger and hit continue. 5) You can now do something every time a new row has been created in the table. The data from this new row will be available for you to use in the Zapier action step. Set up your action app and you're all set! 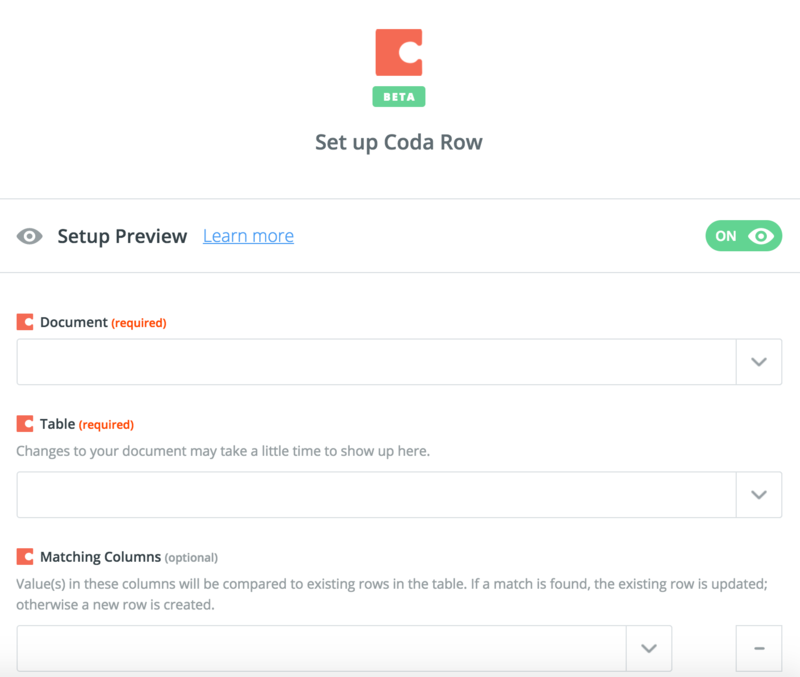 Using Upsert Row, you can create or update new rows in Coda through Zapier in a single step. Since this is done in a single step, you will NOT have access to the data within existing rows before updating them. 4) You'll be asked to choose an action - pick "Create/Update Row." 6) You'll be asked about matching columns. Create new rows only: If you only want to create new rows, leave the "Matching Columns" field blank. Create/update rows: If you want to update rows through Zapier, you'll need to add the names of your Matching columns. If you include these, we will use the value(s) in this column(s) to identify a row to update. If it is left blank or we do not find a match, a new row in your table will be created. 7) The next step is setting up the row you are inserting. Once you've selected a table, the page will refresh with a list of columns that you can insert data into. 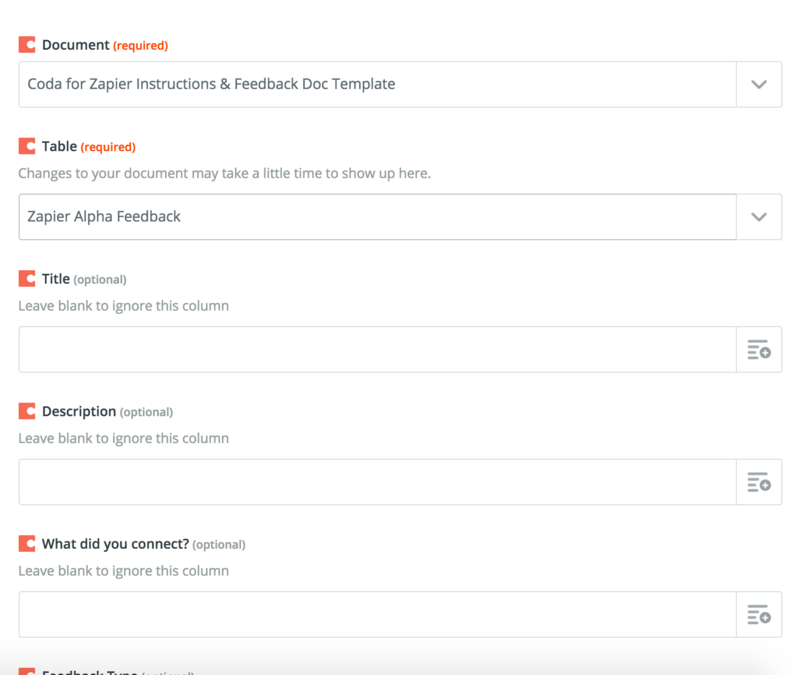 Note, if you need to add more columns, go back to the Coda doc to add them and then refresh the Zapier page. It make take a few seconds for the new columns to show up. Why don't I see formula based columns in the column list in Zapier when I am creating/updating a row? Since formulas apply to the entire column, we do not allow you to edit them on a per-row basis. For this reason, we do not expose them in the create/update row action in Zapier. How do I write to people or look up columns? Do you support time stamps in your date-time and date column formats? Yes, we will automatically convert Unix time stamps to date-time and date column formats. Note that we render these times in Pacific time.